I’m just a girl … Who likes beer. Like most craft beer geeks, I became interested in beer because I liked the taste. But I soon realized that craft beer is more than a beverage; it is a community of awesome people that support each other. (In what other business will your “competitors” promote your products?!?!) I am fascinated by the ‘human side of beer’ and love talking with brewers and others in the industry to uncover how their past experiences influence their profession. In an effort to support the burgeoning craft beer scene in Chicago, I will interview the owners/brewers of up-and-coming breweries and showcase their operations. I will also provide recaps of beer tastings/events that I attend and my adventures in homebrewing. Want even more fabulous beer content from me? Check out my posts on the Illinois Craft Brewers Guild website! Awesome blog! My girlfriend and I are both beer lovers – mainly darker brews, ambers, and the like. She’s a German and loves her hefty German beers. I’m more a Yuengling girl, but Corona on a hot summer’s day, too. Thanks for the comment, too! Loved your Brew Hey Hey post. I’ll be at Brew Ho Ho and would love to connect. Hopefully I can get Bro’s Brew into Chef Won’s hands. I am part of the Evanston Homebrew Club and we have a free beer exchange called Thirsty Third Thursday at Prairie Moon in Evsnston. Feel free to stop by. Thanks for the comment, Sean! I’m hoping to go to Brew Ho Ho. Both previous events have been awesome! I definitely need to come up to Evanston to one of your events; hopefully sometime soon! Thanks again and let’s meet up at Brew Ho Ho! Hi gorgeous! I’m loving keeping up with your blog. 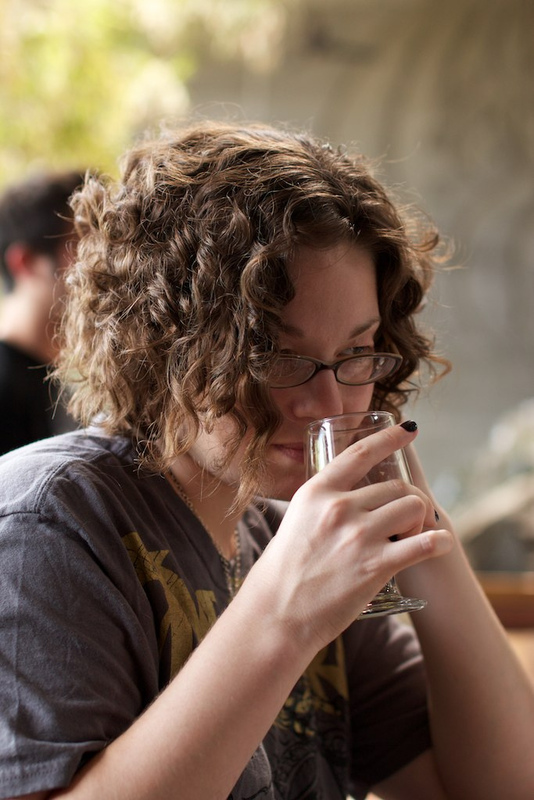 I have been trying to get my girlfriends to take beer tasting as seriously as wine tasting, but we don’t exactly has the caliber of breweries out here that you do. Come visit anyway! We have to plan our East Coast pub crawl! Hi Erwin! Thanks! So… When are we meeting up again to relive the BEST SUNDAY EVER??? A comfortable inviting tap room for sampling all of their current fresh beer offerings. Thanks Chris! I’ve heard of you guys and will hopefully be making it out the suburbs soon! Can’t wait to try the beer! My boyfriend (homebrewer/beer lover) and I (beer lover) are coming to Chicago in June. We will only have so much extra time to visit the local breweries, so I would love some recommendations. If we can only visit 2 or 3, which ones should we put at the top of our list? Another alternative/addition would be a good brewpub that has several local brews on tap. Feel free to email me if you don’t want to post them here. Thanks! There are so many great choices! Haymarket Pub is a brewery and has a ton of excellent house beers on tap, but also has an extensive guest draft selection. If you can only make it to one place, that would be my recommendation. Other brewpubs are Revolution, Piece, and Goose Island, and Half Acre is a production brewery but has a tasting room. But as a beer lover you should try to also hit up Hopleaf and the Map Room, one of the best beer bars in the country! If you need further recommendations let me know!! Sure! Send me an email at girlslikebeertoo@gmail.com. Cheers! I really like the idea of this blog, My wife is not a beer fan, but I was home brewing a stout the otherday, She commented on how good it smelled. who knows. mabey she’ll change her mind! Thanks for the comment! I find that there is a beer out there for everyone – just encourage her to keep tasting! Cheers!